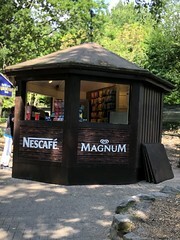 Take a break between adventures and stop off at this kiosk in the woods. Gloomy Wood Kiosk is currently operating seasonally, so will only be open of busier days. Located on the path between Gloomy Wood and Forbidden Valley, this kiosk sells a full variety of chocolate, sweets, and other treats to be grabbed on the go!